As parents we all want the best for our child, but so often we give in to societal pressures which can result in us over-managing every aspect of their lives leaving them overwhelmed, over-scheduled and lacking motivation. This can terrifyingly lead to mental health problems as adolescents and adults. How can we prevent this happening to our child? Over their combined sixty years of practice, William Stixrud, a clinical neuropsychologist, and Ned Johnson, the founder of an elite tutoring agency, have worked with thousands of children all facing this problem. Together they discovered that the best antidote to stress is to give kids more of a sense of control over their lives. In this ground-breaking book they reveal how you can actively help your child to sculpt a brain that is resilient, stress-proof and ready to take on new challenges. 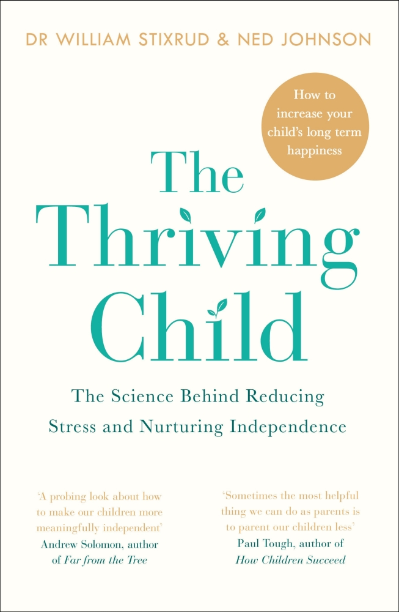 The Thriving Child is essential reading for every parent and demonstrates precisely how nurturing independent thinking, and collaborating with your child rather than micro-managing them, will lead to happier, smarter and stress-free kids.